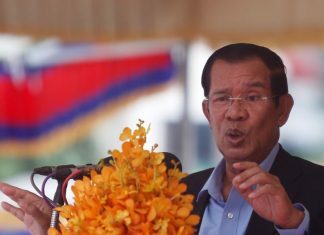 Citing a big boost from Cambodia’s vast rubber tree plantations, Prime Minister Hun Sen on Tuesday said the country’s forest cover had been increasing, before blasting an NGO critical of the country’s illegal logging trade. Mr. Hun Sen boasted of Cambodia having more rubber tree plantations than Vietnam, saying that the trees would become part of the total forest cover, despite the rubber forests belonging to production factories. “Our forest cover is now 49 percent, and as other protected areas are included in the future, our forest cover will be vast,” he said during a national forum on protection and conservation of natural resources in Phnom Penh on Tuesday. The premier said a new military brigade he established this month in Stung Treng province would also take part in conserving forest in the province’s sprawling Virachey National Park, the target of much past illegal logging. 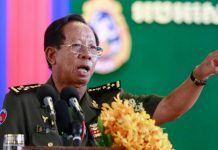 The announcement of the new infantry came less than a week after a sudden and heated border crisis with Laos, which borders Stung Treng province, was resolved. Mr. Hun Sen said those who logged trees may as well be sawing at him—“felling down trees is not different from axing my head”—before taking the opportunity to once again lash out at environmental and anti-corruption group Global Witness. country. In its most recent report on Cambodia, “Hostile Takeover,” Global Witness claims the entire Hun family has significant shares in more than 100 companies with a combined capital of more than $200 million in economic sectors including forestry. 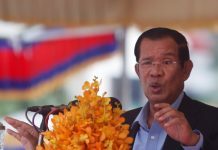 The prime minister’s children accused independent media of conspiring with Global Witness to sully their father’s name, while Mr. Hun Sen has called the organization ignorant, stupid and “crazy.” On Tuesday, he continued his criticism. Research by the University of Maryland in the U.S. has shown that Cambodia suffered the fastest acceleration of forest loss in the world between 2001 and 2014, but the rate of that loss has been falling since 2012, when the government suspended issuing new economic land concessions.